With a little one growing faster and faster each day, we know that it’s important for you to choose products that will fit your child for as long as possible. That’s why we encourage you to consider your child’s seated shoulder height when shopping for a new car seat. 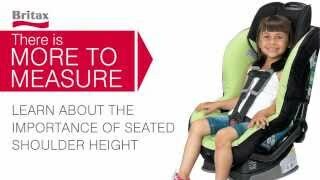 The maximum weight and height capacity are commonly used as a guide for how long your child will fit in a car seat, but many children will actually outgrow the seat by seated shoulder height before reaching the maximum height or weight capacity. In both rear-facing and forward-facing mode, the position of the harness straps on your child’s shoulders and the position of your child’s head within the car seat are the key factors that determine when your child has outgrown a car seat. Both of these measurements are related to your child’s seated shoulder height. Sit your child on the floor against a wall. Place a ruler or straight object across the top of their shoulder to mark the height. Measure up from the floor to the top of the shoulder marker to get an accurate seated shoulder height measurement. To help you monitor your child’s fit in their car seat, we've included a Seated Shoulder Height Label on all of our convertible car seats. This label acts as a guide to let you know how much room your child has left to grow and when it’s time to look for their next child restraint. Once your child outgrows their convertible car seat, we recommend that you get to know your Booster Basics before making your next car seat purchase. While some children might be the right size, age and maturity for a belt-positioning booster seat, the National Highway Traffic Safety Administration (NHTSA) recommends riding in a 5-point harness as long as possible and, therefore, a Combination/Harness-2-Booster seat might be a better option.